symbolic racism | Stop Dog Whistle Racism! Racism is the American tragedy, and as the current political campaign reminds us, it comes in many shades and colors. Sometimes it is explicit, as when a Georgia bar owner visually compared Senator Obama to a playful monkey, or more recently when a San Bernadino Republican group distributed Obama Bucks adorned with visual racist stereotypes linking African Americans with watermelon and fried chicken. At other times it is a bit more subtly coded, as when anationally syndicated political pundit emphasizes “blood equity” rather than “race or gender” as a sign of one’s fitness to be president, or when the current housing crisis is blamed on the efforts of ACORN, a “community organizing group,” to facilitate mortgages for “low income groups” and “inner city” residents rather than, say, on those within the financial industry who targeted such communities for subprime loans in the first place. All forms of racism are troubling, especially for a nation dedicated to social and political equality, but in some respects these more subtly coded versions are all the more pernicious because they operate under a thin veil of interpretive ambiguity that enables such advocates to absolve themselves of the responsibility to acknowledge (let alone to justify) the insidious implications of the views that they espouse. A defender of the scene might argue that the photograph clearly marks the tension between “security” and “liberty” that is symptomatic of political culture in a liberal-democratic polity. The pivot point, one might note, is the yellow police line that marks the often tenuous division between public order and chaos. 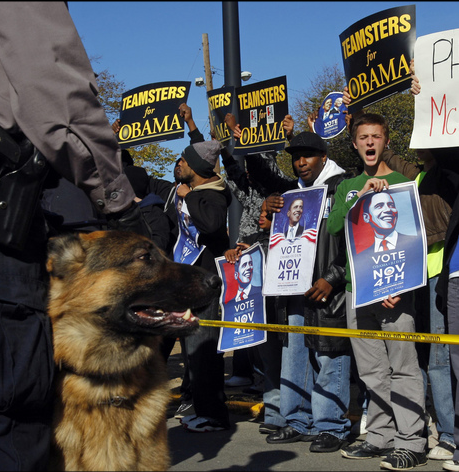 Shot from an oblique angle, the image distances the viewer from easily aligning with either the police officer and dog (the signs of public order) or the Obama supporters (the signs of potential disorder); it thus invites and implies a degree of viewer objectivity that encourages us to treat such tensions as regular and ordinary: protest is legitimate within bounds, but so too is the exercise of state authority, and as long as the two operate in careful equipoise all is well. But, of course, such an analysis begs the larger question: Why the guard dogs? What is about this particular event that warrants the presence of dogs trained to kill upon command to guard the public welfare against what appear to be peaceful and orderly Obama supporters? There are no doubt answers to this question that deny any racist implications to the image or the scene it records, but as with those who invoke specific racial stereotypes only to deny any racist implications to their comments, such responses willfully ignore the history and symbols of American racism writ large. And one prominent symbol of that racism has been the use of dogs to manage and control African American populations. Of course, the presence of a single symbol of racism at one political rally will not, by itself, animate or sustain a culture of racism and racial anxiety—or at least not for very long. The problem is that at some point the accumulation and concatenation of such symbols, explicit and subtle alike, reinforce and eventually naturalize one another. And when that happens it becomes increasingly difficult to resist the power and appeal of their “common sense” pretensions.